No cancellation policy: in event of no show we will charge the full amount of the cost of staying. It is required the payment of 50% of total amount with the reservation. The newest most central hostel apartments for travellers on a budget! In the charming Old Town in front of Ferries terminal! Airport shuttle, home cinema & breakfast! 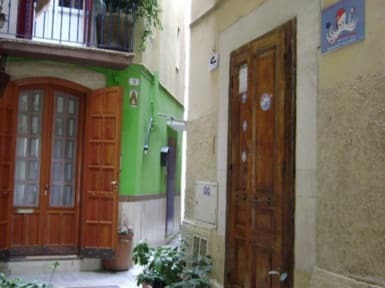 3 detached structures in the charming Old Town from only 24,90 euro per room! Santa Claus is the bigger novelty in the typical structures of Anglo-Saxon hostel, flat rental and bed & breakfast in Europe. This structure was designed with the intention to create a traveling accommodation. Our guests depending on the needs and habits have a way of being able to stay in more detached structures, so as to ensure a free day and night Tour in the charming Ancient Town. Also, not too far from us, you can admire the art of our fishermen. Every morning, pull up their small boats at the port (after spending hours and hours at sea during the night), and cleaning products that we gave them the Adriatic Sea. Our visitors will also be present at the time of cleaning and to purchase of fresh seafood, which only here in Bari, in total security, can be eaten raw or cooked, and which are a symbols of pride and economic development and territorial integrity of our town. At your arrival in Bari, to come to Santa Claus, you can climb through stairs or you can choose to path along the walls, so-called 'Muraglia'. Inside these Walls is enclosed the Old Town, the most focal point in which stands the most part of active business, ancient traditions, museum, churches, bars, clubs, disco, sushi bar, restaurants typical of the area. From the walls you could see the beauty of one of the longest Promenades of Italy. And the sea, in Bari, and for its inhabitants has long traditions, memories and it is the main source of livelihood for most of the families of the Old Town. Santa Claus is the only suggestive and cheapest accommodation of the area, located just in front of City Port (Ferries and Cruise Terminal), at 4 minutes from train station (by urban bus number 20/) and at 15 minutes from airport (by urban bus number 16). Just follow the up-hill called Strada Porto Nuovo in front of Port Exit and you will reach Piazza San Pietro and then search for a small arch, called Arco San Pietro next to the Caffe.Follow otherwise the stairs in front of Port Exit and then you will straight reach Arco San Pietro n. 4. Do not forget to call us and we will pick you up with our private shuttle! Santa Claus includes three structures, inside the main and typical arch of the Ancient Town, each one far just few metres from others. The first one is Don Vito Trulli, in front of St. Peter Arch, in Arco San Pietro 4, built following the typical architectural structure of Trulli in Alberobello, that offers 'Sleep & Go' solution for travellers on a budget, proposing to anyone in need of accommodation and breakfast, the possibility to use the service. A night here goes up from 24,90 eur breakfast included. At Don Vito Trulli does not deny anyone the opportunity to refresh and relax at any time. You can not let it slip. 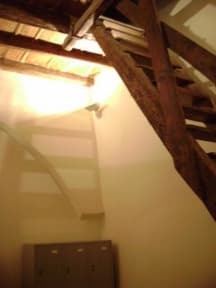 At Don Vito Trulli you will have also free internet access. The second structure is the Freddy House, in front of King Tancredi Arch, so-called, in the name of Freddy Mercury, leader of Queen, that twenty five years ago in Bari played in PetruzzelliTheatre, one of the most important theatres in Italy. In Freddy House you will find Superior 4 bed dorm with private bathroom, Superior double room with private bathroom, Imperial apartment for three adults with private bathroom, Imperial apartment for four adults with private bathroom, Imperial apartment for five adults with private bathroom.All rooms and apartments in Freddy House have private bathroom, refrigerator, air conditioning, plasma TV, home cinema.A night in goes up from 21,90 Euros breakfast included. The third structure is the Bohemian Rhapsody, in front of Swebian Arch. The Bohemian Rhapsody is a structure deployed in the city centre close to the brand new Petruzzelli Theatre, Niccolo Piccinni Theatre, the shopping centre of the town of Bari, Corso Vittorio Emanuele. Bari is one of the pearls of the Adriatic, rich with history, culture and tradition. Our milestones are: the beach, nice weather, welcoming town full of kindness and warmth and a wonderful Mediterranean cuisine from medieval origins, and architectural style, such as the Apulian Romanesque, envied by the rest of the world!In Bohemian Rhapsody you will find Superior 4 bed dorm with private bathroom, Superior double room with private bathroom, Imperial apartment for three adults with private bathroom, Imperial apartment for four adults with private bathroom, Imperial apartment fo five adults with private bathroom.All rooms and apartments in Bohemian Rhapsody have private bathroom, refrigerator, air conditioning, plasma TV, home cinema. It will be evocative and interesting! Please note that we preauthorize credit cards in order to accept your booking. if your credit card will be invalid or with insufficient fund, we'll ask you to provide us with another one. If you fail to do so, we reserve the right to cancel your reservation. Check in policy: from 10,30 until 13,00 and from 15,00 until 22,00. Please respect our check in policy, if you intend to check in later please communicate to us.